Jack Miller joined the MotoGP series on a Honda in 2015 as the first rider to move directly to the premier class from the Moto3 series. He has been on a Honda in MotoGP ever since, most recently with the Marc VDS team. Numerous reports, principally from Europe, indicate Miller has decided to accept an offer from the Pramac Ducati squad to ride as a teammate next year with Danillo Petrucci, a rider who has recently been dicing at the front with the best. Don’t expect an official announcement regarding a team switch by Miller until after he competes for Honda in the Suzuka 8 Hour race later this month. No one has done anything on less than a FACTORY Honda… only Yamaha and Ducati do that. Without rain the second rate Honda is not competitive. Put Marc on it with the same team and while he’ll ride it to the best results ever, he will not come close to winning. I’m honestly surprised that he got any other offers to ride, from any of the manufacturers. What a disappointment in terms of results AND the unfiltered comments. If he was a real threat… yeah maybe okay, not classy but you’ve earned it. He’s constantly in the slower groups and was supposed to be The Next Big Thing. I lost interest in his career long ago. With his results, commentary and behavior, I am also a bit surprised he got the nod from Pramac. 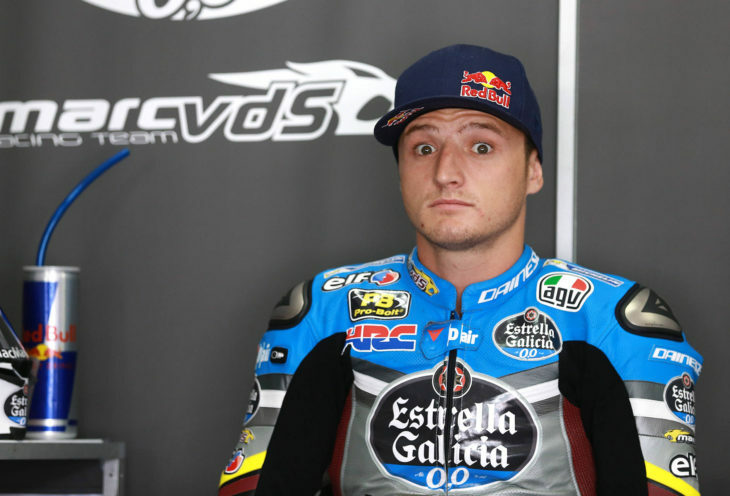 But then Tito Rabat was Pramac’s second choice, so maybe they just have a low budget. Well us aussies dont exactly have much to root for these days so here’s hoping he doesnt do a Stoner and shuts his trap while winning races! Poor Lorenzo. If this rumor holds true, then he’ll have three Ducati riders routinely besting him. You think? I was under the impression Jack had been a pretty big disappointment in MGP, save his (rain) win. Just making a joke really. In truth, I actually expect Lorenzo to be pretty strong next year. yup, and this Aussie’s got no qualms with acting out and behaving like a total prick should this occur. he’s no Bayliss or Corser i’ll tell you that. Norm G; what do you mean? I thought he was easy going? The commentators say he one of the most likeable chaps around? Jack tells it like it is, he probably hasn’t had media training so when he does speak he can come across “as a prick” like norm said instead of towing the corporate line like the factory riders do. Try to remeber that he is on a Satalite bike at Mark VDS and he regularly beats Cal Cruthlow who is on a factory bike so there is no doubt in my mind that on the rite bike he can be competitive with the front runners. Not that I know, but that still surprises me. I know Jack is best buddies with Chaz Davies and a few other boys, and heard he went from motohome party to motohome party. Anyway, for us Ozzies, we dont exactly have much to root for these days so kinda hoping he doesnt mouth off like Stoner and can win some friggin races, thats all! Well, us aussies dont exactly have much to root for these days so here’s hoping he doesnt do a Stoner and shuts his trap while winning races! Uh, no… It has literally never happened in a race they both finished. Last year Cal finished the series in 7th, Jack finished in 18th. He regularly beats Crutchlow? Me thinks not. more specifically i’m alluding to the needlessly disrespectful exchange between him and Jay during the recent safety meeting at Lemans. did i mention he mouthed off during the safety meeting…? this would be the round where Jack himself had that HUGE get off into the wall at T2. this is MGP not M3, the kid’s gotta pull his head out or he’s not going to be alive very long. this is PRECISELY the concern everybody had about him making the jump from M3. not that “stupid” can be fixed, but he’s proving maybe he does/did need to spend time maturing in Moto2.